6/1942 Enlisted in the Army. 6/1943 Part of the invasion in Salerno, Italy second wave against Germany. This was the first invasion against Hitler’s Europe by the United States. 36th Division took heavy casualties and had to repel a German counter attack. 1/1/1944 Part of the attack on Monte Cassino which had been bombarded more than any part of land thus far in the land. Herman could feel the bombs from his fox hole. After crossing the river at night once daylight came only 40 men from the 141st survived the attack after losing 2,100 in just 48hrs against the 15th Panzer Grenadier Division because of no support from the armored support. 5/24/1944 Herman went to Anzio by sea as part of Operation Diadem to take Velletri and enter Rome, Italy. 6/5/1944 Marched into Rome behind General MacArthur. Hermann remembers taking his platoon past the Coliseum. 6/26/1944 Took Piombino, Italy then were pulled back to get ready for the Invasion of Southern France. 8/15/1944 Moved from the 5th Army to the 7th Army under General Alexander Patch and invaded Southern France. Patch led Herman to a fast offensive up the Rhone Valley all the way through to the Rhine River. 12/6/1944 Wounded at Lavelle in the Vosges Mountains of France near the German border from shrapnel from a German 88 in his shoulder. He was in a field hospital for 5 days before being asked to go back to the front line to his men which only 4 alive from his original company. Clearing of the Vosges Mountains full of Germans was an immense task as some of the regiment even became encircled experiencing heavy casualties. 1945 141st Regiment was the first to land in Europe, first in Southern France, first of the 7th Army to cross the Moselle, and first of the 36th Division to enter Germany. 2/3/1945 Hellseherin, France was the last sector needed to be cleared before crossing the Rhine River and there were blown up tanks everywhere, the 141st took the town with rifles while the German’s counter attacked with armor which inflicted heavy casualties and Herman had to withdraw. The land was flat so it was easy to open up the machines guns on the American’s and the only thing that saved Herman was a small depression in the ground. They sniped and shot 60mm mortars at Herman so he knew that the time was up so he had to surrender. They shot his friend in front of him but did not kill Herman. Herman was able to hide his watch from his parents inside his boot and has this watch to this day. Herman was a prisoner of war for 95 days and lost 50 pounds. The first POW camp was a few kilometers across the Rhine in a dungeon full of rats at Baden-Baden. Herman was in a total of 5 (Baden-Baden, Stugart, Moosburg Stalag 7A, Munich, Stalag 18C) Prisoner of War Camps. 5/8/1945 Liberated from Austria Stalag 18C. There were 100 non-commission officers liberated from the camp by the 143rd regiment of the 36th Division. It was the last camp to be liberated. When Herman was liberated he knew to stay there but all the Russians took off and many died because they had not eaten in years and many died from bursting stomachs. He had to eat a few teaspoons a day of baby food until they could expand their stomachs. Herman was trucked to Salzburg, Austria then trucked to Rennes,France in C-47s. He was greated by General Eisenhower then took a truck to Le Harve then by ship back to the Newport News, Virginia. Herman kissed the ground and went to the PX for ice scream. 6/1945 All POW’s received a 90 day furlough and had to report to Miami Beach, Florida then to Fort Belvoir, Virginia for Engineering Specialists. Then to Fort Dix then to Camp Shanks then to Fort . 11/27/1945 Received his discharge from Fort Knox, Kentucky. 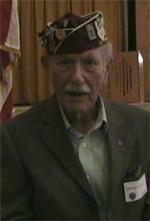 Herman had over 300 days of front line combat duty.